i went for pho (vietnamese noodle soup) today. most pho places take cash only. this has always irked me because we live in an age where the average person does not carry much cash anymore. i don’t. cash never stays in your wallet very long and besides, who really needs it when you can use your debit card just about anyplace these days? i went for pho today. i chose a particular place that i know takes debit cards but it seems that today their machine was down. on the cover of every menu was a lovely little note to let you know that cash was your only option. i think they used babel fish to translate it into english. it’s awesome! 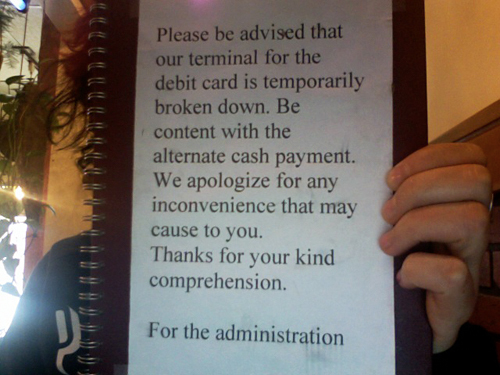 and for the record… i was very ‘content with the alternate cash payment’. the pho there rocks!